Come view this nicely appointed custom built home located in classics plantation estates and built by popular builder robert lundstrom. This spacious and immaculate estate home has many upgrades including crown molding, stainless steel appliances, 3+ car garage, newly painted garage floor, 4 zone a/c system, water purification system, 500 gallon in round natural gas system for pool and cooking, wine room, central vac, volume ceilings, large gas heated pool and spa, separate guest quarters, granite countertops, brick pavers, circle driveway and a large upstairs loft thats perfect for entertaining family and friends for all occasions. Players club & spa membership (optional) is available to buyers as well as golf membership choices. A close-to-everything location in naples, florida, this luxury real estate community has three championship golf courses, the players club & spa and a cosmopolitan atmosphere amid lush natural surroundings have made lely resort golf & country club one of the most sought-after naples community. Home is ready to move right in! Nestled amongst the lovely landscape, water and views lies this sophisticated tiger island estate residence in a pristine setting on tiger lily drive. Immaculate home offers elegance and plenty of natural light throughout its open layout. Special highlights of this include three large bedrooms, 3. 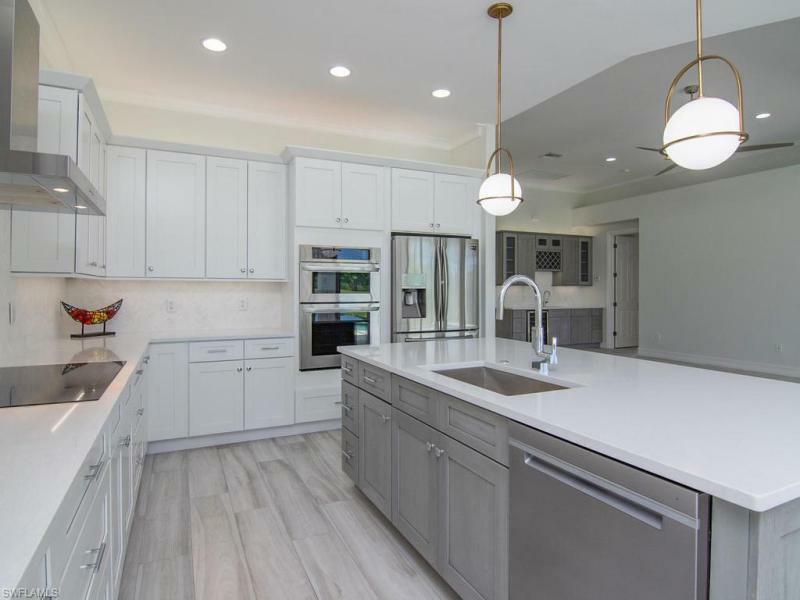 5 baths, gracious gourmet kitchen, large and inviting great room ideal for entertaining with enchanting water views, marble throughout and hardwood floors. Sprawling entertaining space flows outside to the generously sized patio area that can be enjoyed year round. The views are truly breathtaking. 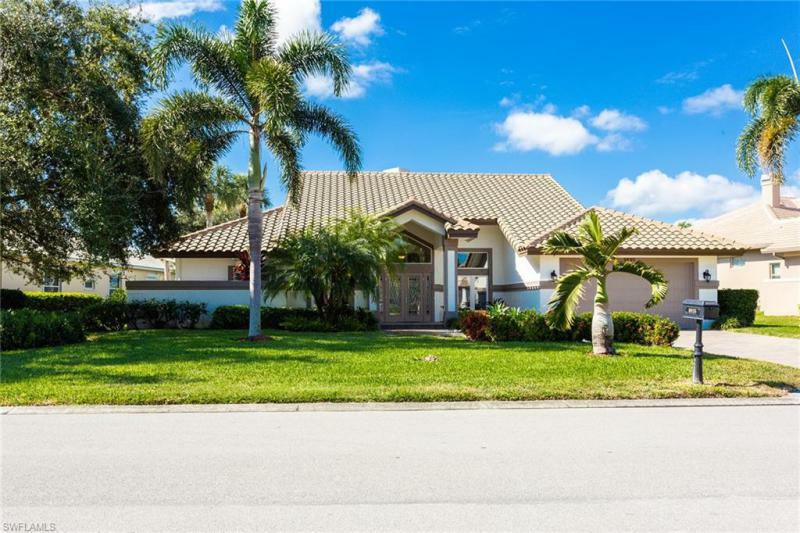 This residence is situated in an ideal location, close to everything and just minutes to the best dining, shopping venues, highways, beaches in naples/marco island. Come enjoy the beauty of lely resort! Owners are motivated and looking for offers! 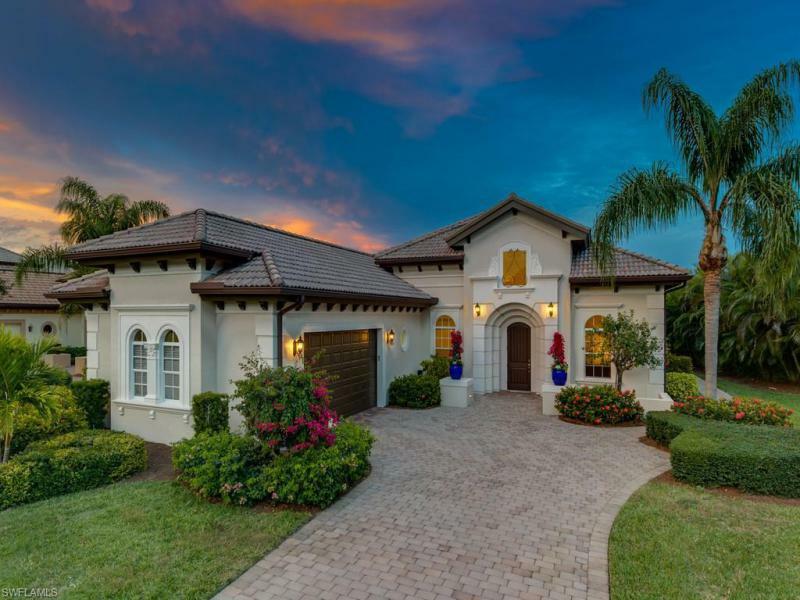 This exquisite home in lely tiger island estates won't last long! Stunning custom comforts with the elegance of golf course estate home living! Over 3000 sq ft of living area; this spacious 3 bedroom, den, 3 1/2 bath, split plan will amaze you with its architectural lines and features. Some of the many features include solid wood flooring, stainless steel appliances, soft close drawers and cabinetry, custom blinds, custom lighting, tray ceilings, paddle ceiling fans, crown molding, sliding pocket doors, central vacuum, security system, intercom and music system, master bath with soaking tub and rain shower, pool bath, new a/c, large two car garage with finished floor. The over-sized lanai is perfect for entertaining or relaxing while enjoying the spectacular long lake views! Enjoy sitting by the heated hand cemented pool with waterfall spa and privacy wall. Lely resort offers 3 championship golf courses and the players club with optional memberships, brand new clay tennis courts with stadium seating, bocce ball, shuffleboard and pickleball. Minutes from marco island, 5th avenue and 3rd street dining, shops and white sandy beaches! 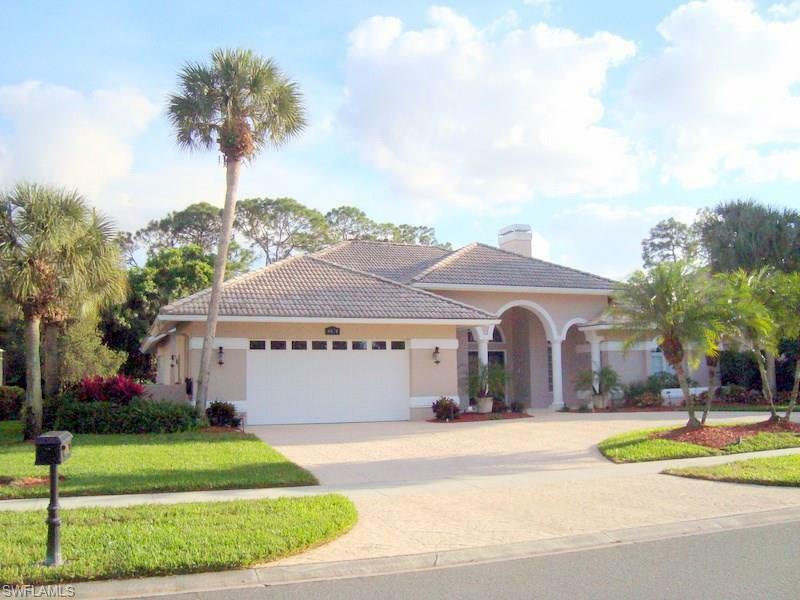 H. 14158 - elegantly upgraded waterfront montessa floor plan home in small gated community in lely resort just waiting for buyer looking for quality. Custom pool & spa w/ picture frame screening on lanai, waterfall, ozone filtration system & economical solar heat. Sellers replaced original paver lanai w/ travertine. There is also an outdoor shower! Private cul-de-sac location, paver sidewalk from front to rear lanai. Kitchen granite has been upgraded, kitchen upgraded with additional wood trimmed cabinetry, induction cooktop, new built in range & advantium microwave & kinetico water filtration system. Crown molding in most rooms. Exterior repainted a light off white. Home fortified for storm protection w/ impact glass windows & sliders, impact front door & some shutters. 4 foot garage extension, great storage! Rough in plumbing for outdoor kitchen, tv outlet on lanai, audio speakers in several areas! So much more! Incredible, much awarded players club & spa is mandatory, tennis, pickle ball, 3 resort pools, huge fitness facility w/ classes, spa, bocce, great social program, best club value in southwest florida! Den/office has closet & window, could be a 4th bedroom. Watch the video! 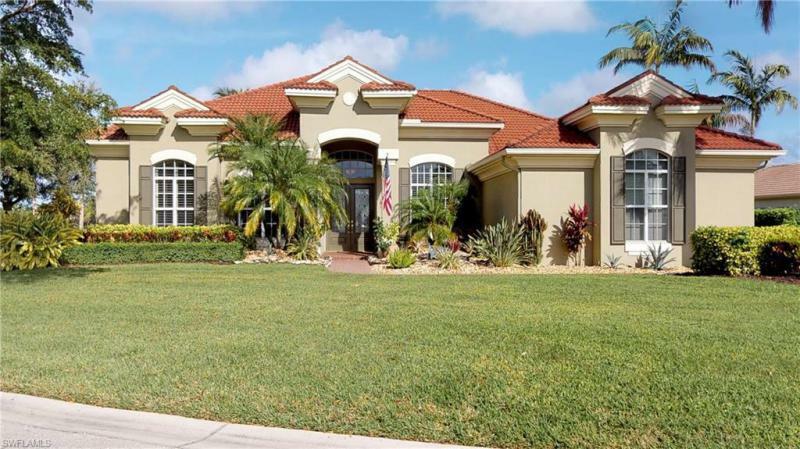 A circular drive leads you to the front entrance of this magnificent home in lely island estates. Enter the double beveled glass front doors to a grand open concept living room. The enclosed lanai has a lovely southeastern golf course view. Golf is optional in this beautiful home. The impressive eat in kitchen has granite counter tops and stainless appliances. There is tile throughout the main living areas, a gas fireplace and wet bar in the living room with a dramatic vaulted ceiling. Custom crown moldings adorn the living areas. Formal dining room with chandelier is being utilized as a den. There is an outdoor kitchen area on the large lanai for casual entertaining. Pool and hot tub have been re-tiled and resurfaced. Over sized two car garage gives you extra room for storage as well as an additional refrigerator. Custom window treatments and new ceiling fans throughout. This home is a must see! A new roof was just installed and a new cage is to be installed at the end of march 2019. Just what you have been waiting for!! New and updated! Don't wait to see this one of a kind unique custom completely renovated 3 bedroom 2 bath pool home with private golf course and lake views in a low fee community. This home is loaded with the finer finishes which include custom remote controlled window treatments, plantation shutters, new tile plank flooring throughout, new kitchen appliances, wifi enabled double oven, newer hvac and pool equipment, new bathrooms, induction cooktop with pot filler, frameless shower doors, new kitchen bathroom and laundry cabinets, quartz countertops, fresh paint in and out, crown molding throughout, central vacuum, new wet bar, new rear landscaping, and an amazing peaceful sunny views! Open sundays 1-4! Enjoy this beautiful residence with a gorgeous paver courtyard entry. Adjacent to the main house is a detached guest suite with a spacious bedroom, full bath and kitchen ideal for friends and family. Relax on your private newly paver lanai with upgraded large picture-screens boasting expansive south lake views and lush landscaping. This home is equipped with electric and manual shutters, a security system, and a two-car garage with a keypad. Furnishings are negotiable. The light and bright interior features an open floor plan. The kitchen is appointed with granite countertops, breakfast bar seating, pantry, and stainless steel appliances. Tropical views can be seen from the master bedroom which features dual walk-in closets and an en-suite. Only minutes from downtown naples, beaches and marina, an extraordinary lifestyle is waiting for you in lely resort!